The most Venerable Kyabje Gosok Rinpoche is a Buddhist monk acknowledged in Tibet as the emanation of a whole series of distinguished spiritual masters. As such, and especially due to his exceptional ability to express loving-kindness and compassion as well as to impart wisdom, he is said to be very precious for sentient beings. In this way, he appeared in his lineage of incarnations as the Omniscient Kaudinya, the eldest of the first five disciples of Buddha Shakyamuni. Later, in Tibet, he was incarnated as Döndrup Gyatso, a famous abbot of the Drepung Gomang College. Along with Sera and Ganden, Drepung is one of the three main Tibetan monastic universities. Gosok Rinpoche’s lineage, whose name calls to mind his monastic affiliation and Mongolian roots, stretches back to that master who belonged to the Gelugpa or Virtuous Tradition. 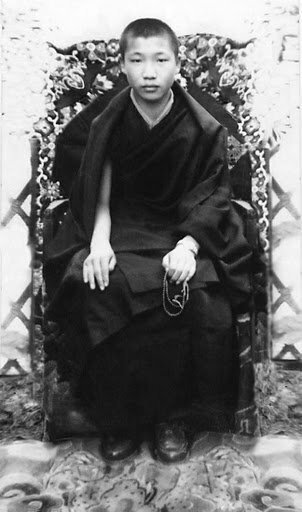 As a lama in the Elders tradition, Rinpoche was most notably Longchen Rabjampa, one of the illustrious codifiers of the Great Perfection teachings. He was also Rigzin Lhungsal Nyingpo, a famous meditation master. 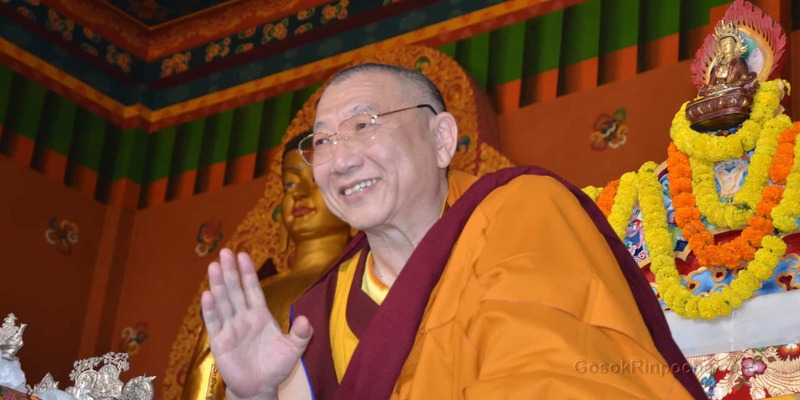 Well-known for his unbiased views, the most Venerable Gosok Rinpoche embodies in this way a lineage of eminent spiritual guides who belong to the four traditions of Buddhism in Tibet. The current Gosok Rinpoche was born in 1948 in the village of Molha, near Lithang, the main town in the eastern Tibetan Kham province. His birth stood out on account of the numerous auspicious signs, the same ones as had been pointed out at his predecessor’s birth. When he was four years old, he was recognized as the reincarnation of the previous Gosok Rinpoche by the Dalai Lama’s tutor, Takdrak Rinpoche. Enthroned the following year in his monastic house, the Gosok Ladang, he was acknowledged as such by the countless monasteries and families that traditionally came under his spiritual leadership. And three years later, he went to Lhasa to pursue his religious training at the prestigious Sera Med monastery. 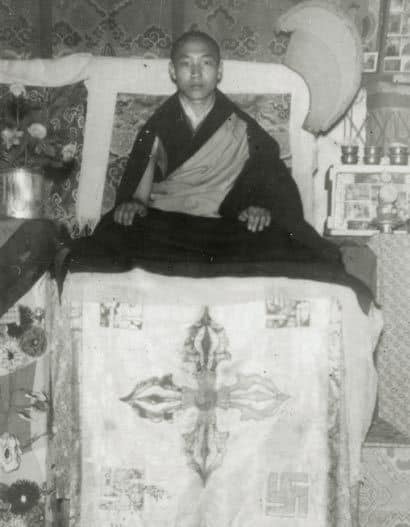 In 1959, Rinpoche, who was eleven at the time, fled Tibet and went to India. In 1961, he was involved in the building of the new Sera monastic complex, near Mysore, where he continued his studies. 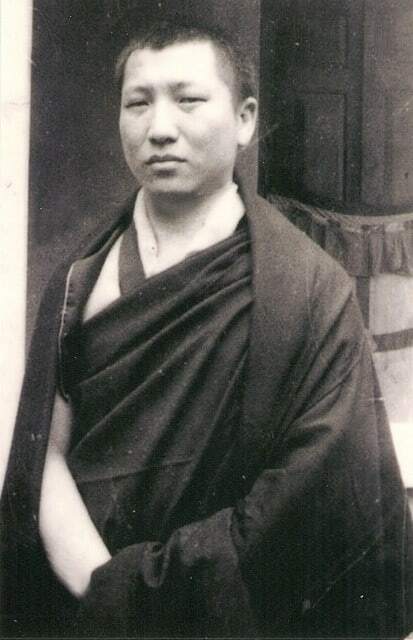 When he graduated at the age of 36, he ranked first among the Geshe Lharampas. That qualification is the equivalent of the highest level of Doctorate in Buddhist Philosophy. He was awarded his degree after having taken part in intense dialectical debates that brought together the most distinguished religious leaders from the three great Gelugpa monastic universities. 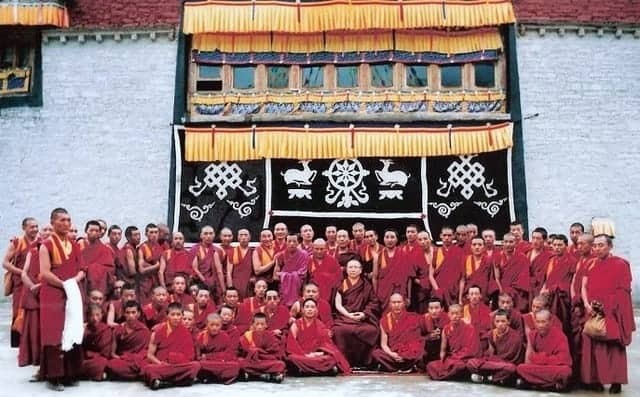 In accordance with tradition, Rinpoche perfected his religious training in the Gyumed Tantric College where he was awarded the degree of Geshe, expert in tantric teachings . With its monks numbering 500 at the very outside, this monastery, like the Gyutö College, is the largest Tibetan religious school whose curriculum exclusively consists of Buddhist tantric studies and meditation. In 1984, Kyabje Gosok Rinpoche went on a year-long pilgrimage to Tibet, in the Kham province. At the time in close contact with a religiously committed public and in over 40 monasteries, he gave numerous teachings and ordained many monks. That important trip was rounded off by a month-long visit to China. After his return to India the following year, His Holiness the Dalaï Lama appointed him as Vice Abbot of the Gyumed Tantric College. 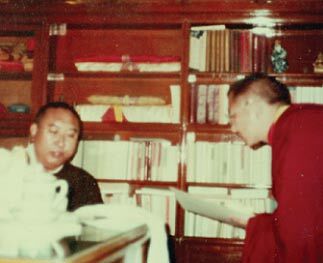 In 1986, Rinpoche traveled to Osaka, Japan, where he took part in a religious conference organized by major Buddhist temples. On that occasion, he gave talks and public lectures as well as initiations to 25 eminent Japanese abbots. 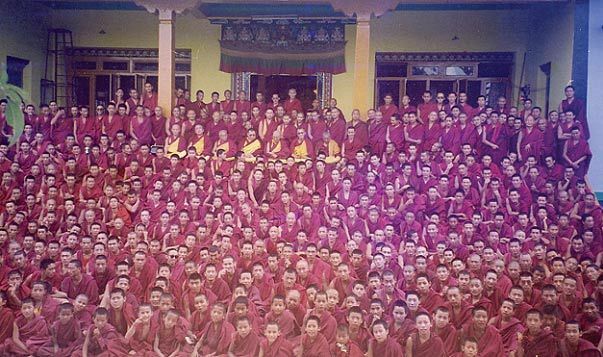 Two years later, in 1988, Kyabje Gosok Rinpoche acceded to the position of Abbot of the Gyumed Tantric Monastery, where he became the youngest abbot in charge ever since tantric colleges were set up. Under his leadership, Buddhist studies and tantric meditations were given new impetus. Moreover, thanks to generous financial backing from a Japanese Buddhist association, he helped in the refurbishment of the monastery. Cells for monks, a retreat center as well as a new large prayer room were built, and then inaugurated by His Holiness the Dalaï Lama in 1990. 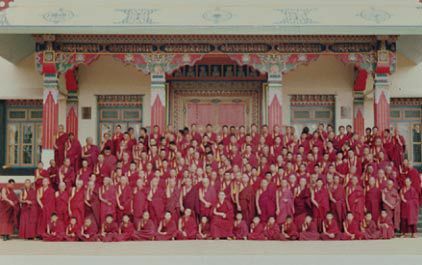 Later, between March 1992 and Summer1996, Rinpoche became Abbot of the Sera monastery, which, at the time, brought together some 5000 monks. In the course of close on five years, not only did he consolidate the complete Buddhist studies syllabus, but he also took an interest in the monks’ living conditions, paying special attention to improving their food and building both a health center and a hospital. 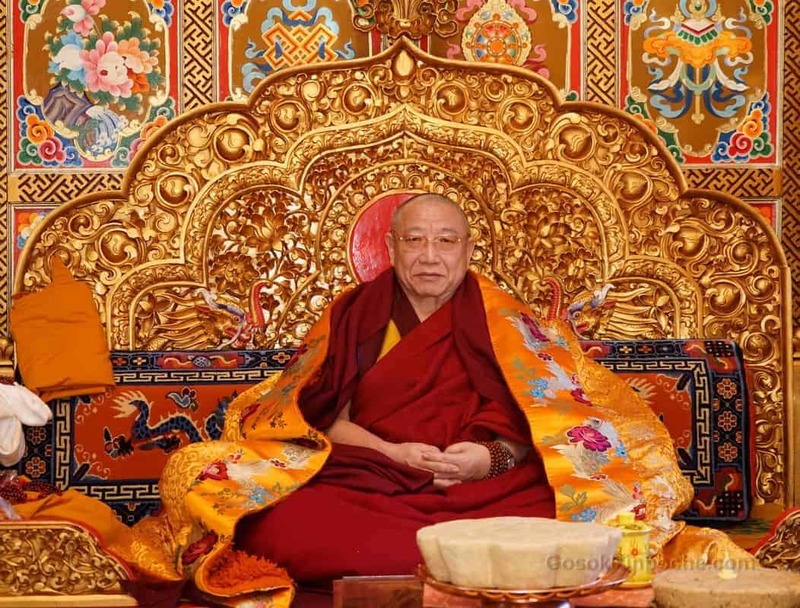 Owing to the positions as abbot he held, Kyabje Gosok Rinpoche is well on the way to reaching the level of Ganden Tripa, successor to the Ganden Throne. Attaining that position means he will then join the lineage of successors to the master Je Tsongkhapa, and in that way take on the responsibility of spiritual leadership in the Gelugpa School. Since Autumn1996, Rinpoche lives most of the time in Taiwan, bringing together disciples he interprets teachings for and organizing retreats. In that way he is working to preserve and spread Dharma in Taiwan that has long had a Buddhist tradition. More recently, Kyabje Gosok Rinpoche founded the Phuntsok Chöling monastery in Kathmandu, Nepal, thanks to the support of a generous Taiwanese benefactor. 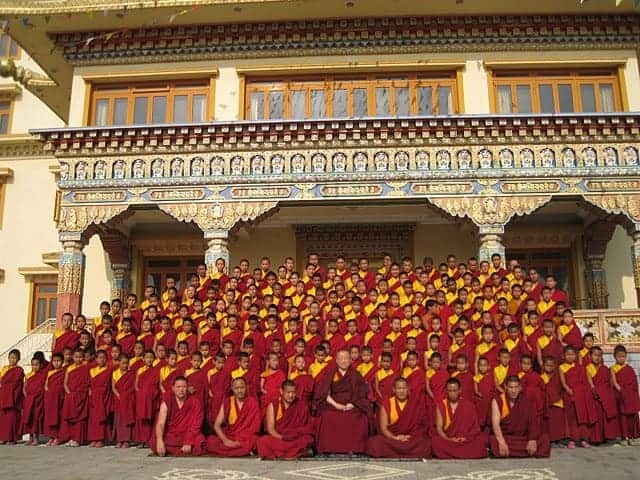 Inaugurated in July 2002, that institution is intended for young monks in particular. 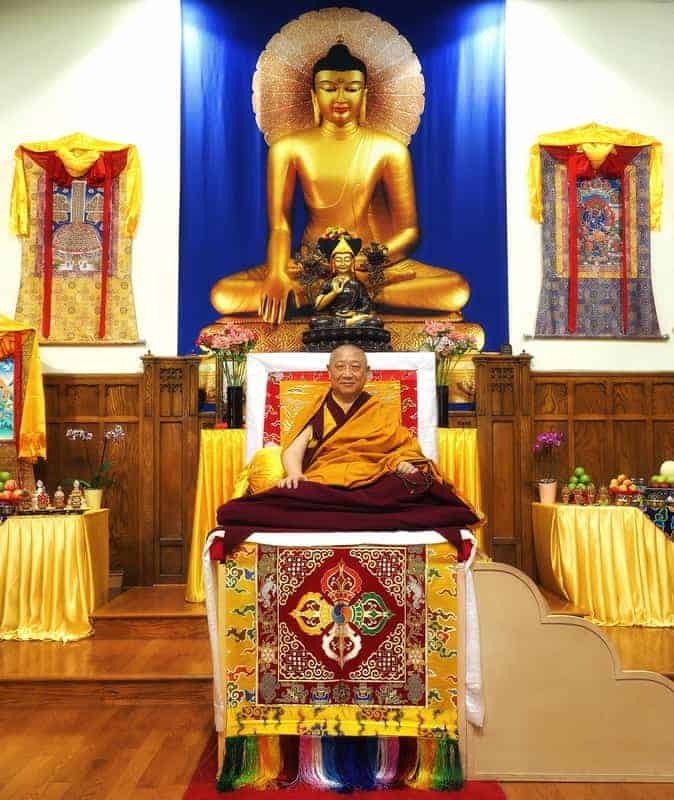 Rinpoche set up a complete Buddhist studies course, which combines traditional religious subjects with the basics in the three R’s and soon foreign languages and computer science will be added. A hundred or so monks now study there. 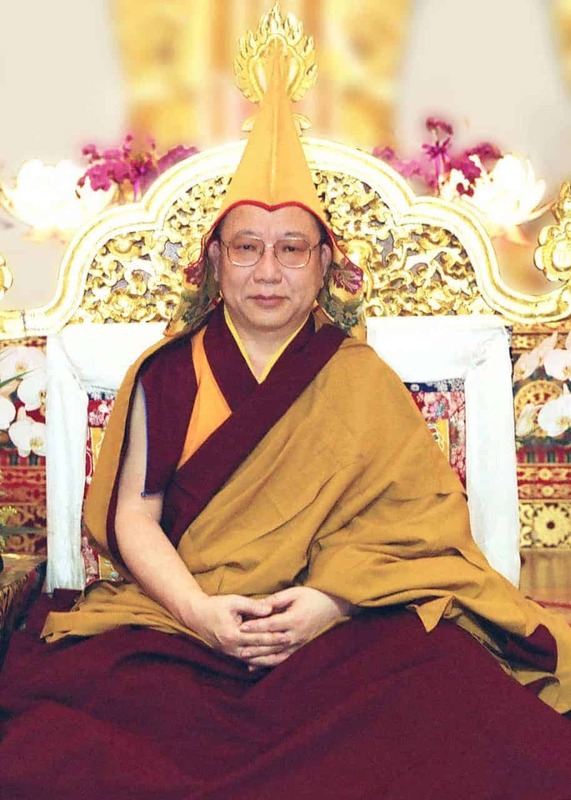 In his attempt to spread Buddhist teachings throughout the world, Rinpoche has visited many European countries (Germany, France, Holland, Italy, Sweden) as well as America (the US and Canada), along with Asia (India, Japan, Malaysia, Mongolia, Singapore, Tibet, Vietnam), not to mention Africa (Togo). Having brought together numerous disciples, he has founded Dharma studies and practice centers in France, Holland, Italy, and Indonesia as well as in Taiwan. As far as the projects he feels very strongly about are concerned, Rinpoche is currently setting up outreach programs in numerous monasteries in Eastern Tibet he is in charge of. Those monasteries have to cope with difficult practical and financial problems so much so that at present they are unable to successfully accomplish their mission. After long years of hardships, restoring dilapidated buildings or those unfit for habitation, laying water pipes along with bathroom plumbing in the habitable ones, and building new housing, has become a matter of some urgency. The ever increasing inflow of young monks in the last few years has in effect turned housing into an unresolved issue that has exacerbated the critical shortage of teaching premises and teachers. The Golok Gönsar monastery is a case in point, which, like many other monasteries, is seriously underfunded. A project is afoot to erect a large building with several classrooms and adjoining conveniences, such as a library, a health center, housing for teachers and doctors, a kitchen and a cafeteria, a store, rest rooms and so on. Similarly, while the villagers’ offerings make up their main source of revenue, the monasteries have to cope with rising everyday expenses, especially when it comes to taking in the most destitute monks. Without proper funding, very many monks periodically are compelled to go out to work. During such times, they are unable to study and forget what they have learned. 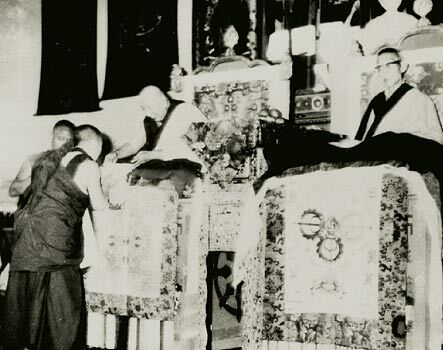 This predicament is obviously a major stumbling block to the activities of study, thought, and meditation, which are all important in the Buddhist tradition.That is why Kyabje Gosok Rinpoche has taken on himself the responsibility of finding benefactors for the monasteries he is in charge of, and sponsors for their monks. Based on the principles of genuine love and compassion applied to daily life, the most Venerable Kyabje Gosok Rinpoche’s involvement aims at helping sentient beings attain real personal fulfillment. As long as the guiding impetus comes from selfless disinterest, help and mutual assistance will always be forthcoming, so that individual and collective problems are quickly cleared up. If human activity becomes useful and beneficial, then it follows that such activity can take on full meaning so that an excellent social set-up may come about. 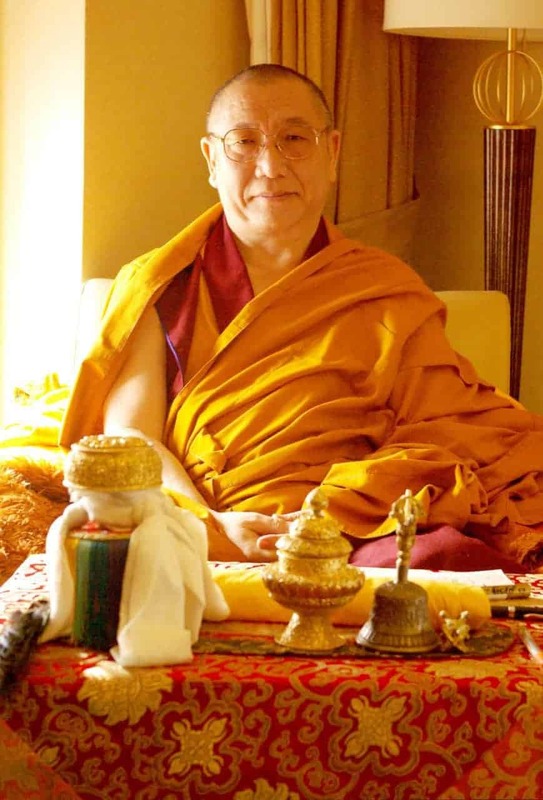 In that way, in his teachings, Rinpoche always emphasizes the relevance of loving-kindness and compassion, which are the valuable qualities required for bringing about a lasting peace and happiness in the world.